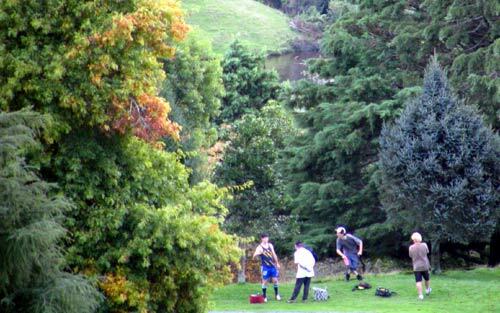 It used to be New Zealand's toughest disc golf course. And by all accounts, Australasia's toughest. 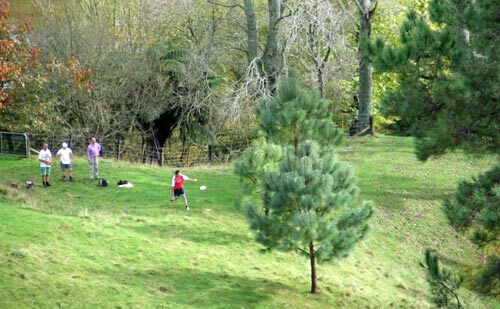 But after someone told Tournament Director Dean Marshall that the Tauranga Extreme was not really extreme, his alterations to the course make it an easy contender for Toughest Disc Golf Course on Planet Earth! This being said, the 20 hardy golfers that turned up for The Extreme were greeted by a park in full bloom with trees of all kinds and colour gently moving in the light breeze that never got past light and was often non-existent. And speaking of conditions, it turned out that this particular area appeared to have the best weather of all of New Zealand that weekend - ha ha! Whilst there was one or two showers, we were mainly treated to warm, often sunny, conditions for all four rounds. The tournament started Saturday morning from the lodge headquarters that was to host half the players over night (by the sounds of it, Simon Feasey (Auckland) had christened HQ on the Friday night with a few samplings of a fine Port). Well, after the first round it was looking to be a race between the two favourites, Dean and Simon, with Simon holding a 2 shot advantage. On a course like this, that can mean very little. Then again, it can mean a lot (shut up Gabb!). The scores overall were pretty impressive considering the testing course - the lack of wind being appreciated by all. Simon's 1-over 57 had everyone wondering if anyone would manage to get sub-par. Bee Gees Live - Golfer come entertainer Baz Keene (Taihape) led the lads in this perfect rendition of a Bee Gees classic at the lodge Saturday night. Wonderful stuff - see young 'fit' lad David Keene out for the count in the background - the old fellas were too much for him! Note: video file size is 4 meg. After a quick nosh courtesy of Subway, the trusty troops headed back out, now in seeded groups. The top two groups were all in contention with a mere 4 shots between them all - staggering when you consider the unlucky rollers and amount of tree bunkers on every hole. By the end of play (after a looong wait for the Waiheke group - always last in by over 40 minutes! ), Dean had pegged back Simon to be dead even with him, firing the first par round of the tournament - nice. Blair Joines (Taumarunui) fired a very fine 1-over 57 to take his 'rightful place' in the top group for Sunday morning. Plus he was determined that Bruno would not end up in front of him after 4 rounds. Ah, the pleasent rivalry of kiwi disc golf. And so it was on to an evening of rest and relaxation. Well, for Dean at least as he sneaked home. For the lads staying the night in HQ, it was Foozball and singing (terrible singing, believe me!) with Pete Boyle providing percussion via a couple of 2 litre plastic bottles and a plastic bin. One would think they were trying to keep poor ol' Simon awake, but he soon quietened them all down by walking out in his jocks for a glass of water - that sight is enough to quieten even Dylan and he wasn't even there! The third round on Sunday is where much shuffling of places can occur as players try to position themselves for the final and last round. Local legend Dean Marshall pulled of another excellent par round to sit ahead of Simon by two shots. There was now some daylight between these two and the rest of the field - 6 shots back to Blair. The Ace Pool was still alive and stories abounded of some very close calls - usually from the strong and steady arm of the agressive Eagle throwing arm of Mexican Wonder Juan Unda (the Unda Thunder Wonder living Down Under!). His grassy knoll shot on his 72nd hole with his famous "Arthur Eagle" was the straightest, most direct shot we have ever seen. That it did not clang straight into the chains was beyond the entire group, but he was pleased to take the gimmie birdie to finish. There were some tired bodies that returned to HQ - for many it was now a case of survival. But for all, the final round was a challenge to see if they could better their 3 previous rounds and secure targetted placings for those crucial Tour Points. Most interest for the large gallery (a man and woman walking their dog) was focused on the top group of course. Was Dean going to play classic Match Play style and try and keep that paper thin lead of 2 shots? A defining moment came on the 10th when a 4 metre putt for Simon bounced out and rolled. And rolled. And rolled. In the end a potential birdie had turned into a quadruple bogie and by the 18th tee Dean had a 5 shot lead. Unbeatable you would say, but remember - this is The Extreme and anything can happen. Sure enough, Dean's drive slammed into the slopes and started what was looking to be a swamp run 110 metres down into the scary (but very picturesque) swamp that had been eating up discs on the 18th, 17th, 1st and 2nd holes. Luck was on Marshall's side as the disc somehow stopped its roll after only 15 or so metres. And so at the end of play, he held onto a 4 shot lead to make it back to back wins on the circuit (he won The Hill by 3 over Simon in April). Great golf and a well deserved win. Disc Golf rookie David Keene continued his surge to the top with an outright 4th place - despite a 2 shot scorecard penalty. It looks like we are to finally see some of the younger players battling the mighty Feasey for the top spot. But based on Simon's great win in Taiwan, it may be some time before the level headed Kingslander lets go of the mantle. Baskets were recovered, hands were shook and shattered bodies retired back to 'real' life. 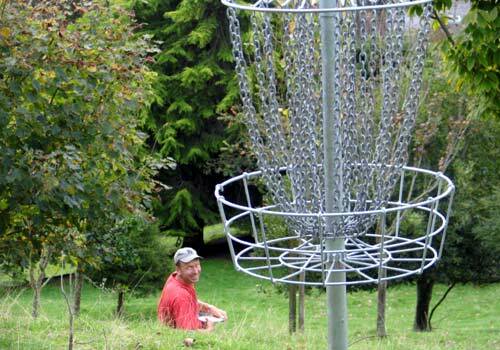 Big ups to all involved, especially Tournament Director and 2006 Tauranga Extreme Disc Golf Champion Dean Marshall. No one shot under par, but Dean was the only player to manage par 56 and he did that an amazing 3 times! And if we find out who told him the Extreme was easy, he'll get a slap around the chops!! 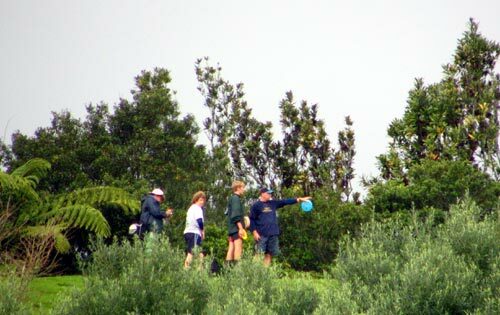 Horsin' Around - Disc golfers were pleased to see multiple users in McLaren Falls Park - here the Waiheke crew are watched by an interested horse rider. National Champ - It was nice to see New Zealand Disc Golf Champ Simon Feasey (Auckland) back from his impressive win in Taiwan. He led after the first round and kept local legend Dean Marshall honest all the way. By the Seat of His Pants - Nigel Hailstone (Waiheke) forehands his second over the crest as one of the local native birds chirps in amusement. Chomping at the Bit - Waiheke Wonderboy Brett Hailstone chomps casually on his 'baccy as he gently guides his disc up to the basket. He then looks across in bewilderment as another putt doesn't slam in like he normally achieves. It was that kinda weekend for Brett. Control Freak - Ming Menzies (Tauranga) shows extreme control at The Extreme. 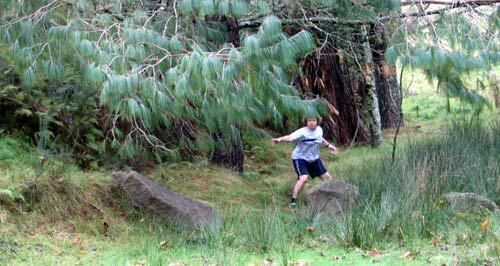 Here on the fifth she expertly levels her disc above the rocks and below the pine needles to land on the green. 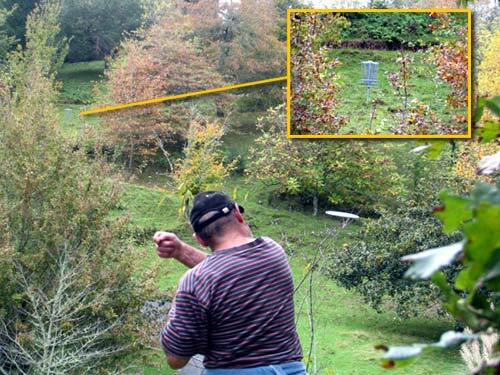 Flick the Little Fire Engine - Hole 6 and trusty forehand expert Pete Boyle (Taumarunui) puts himself in a good position for a birdie as his disc turns over in the classic S-bend. Awesome. Nice Putt! - Nigel Hailstone (Waiheke) shows us the way with this nice putt on the eigth. Go the Arse! - Decked out in the famous Arsenal strip, David Keene (Auckland) lets fly on the first. Oh my Gosh, it's JOSH! - That familiar pose of Pete Boyle (Taumarunui apparently) puts himself in a good position for a birdie as his dosc turns over in the classic S-bend. Awesome. Don't Cry Bro! - Is Brett rubbing something from his eye, or is he reacting to his brother Nigel's kaching into the chains on the 70th hole that surely spells the end of Brett's attempt to beat the little bugger? You decide for yourself! The Big Recovery - Waiheke veteran Nigel Barnwell makes a big 4th recovery after having to work his way back up the hill after a wayward drive on the 14th. Bring to the Boyle... - We had to slow this one down for you - Pete Boyle (Taumarunui) surely wins the most relaxed golfer award. Firing in deadly accurate drives, approaches and putts with the forehand - half the time with his bag in his hand! - we saw him slam a few in the chains from over 20 metres. Wicked! Bruno the Brute! 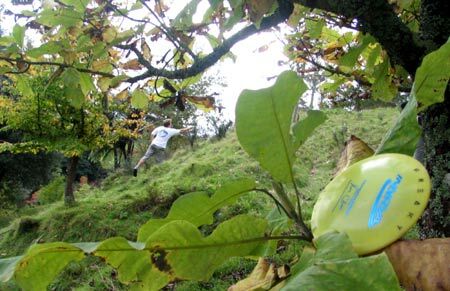 - Another rising star in the kiwi disc golf scene is Bruno Whale (Taumarunui) who is getting ever closer to his goal of beating Blair. But if you ask Blair, "It'll never happen - don't be so silly". Watch this space! Forehand Folly - The trusty forehand shot seems to be as well entrenched in Waiheke as it is in Taumarunui. However here on the 15th Brett Hailstone (Waiheke) looks to regret the forehand choice and is lucky not to be trudging through the pungas!. Stunning Setting - And its all lost on Nigel Hailstone (Waiheke) for a moment as he concentrates on recovering from a horrible drive on the 15th. Now That's Balance! 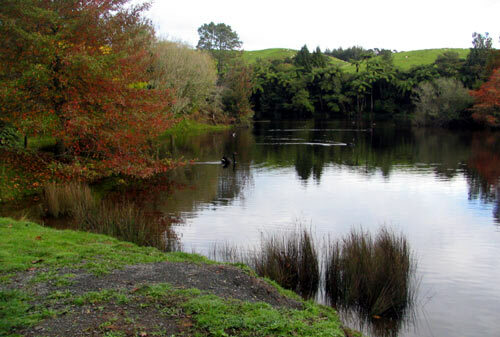 - Caught in a tricky spot on the 6th, Nigel Hailstone (Waiheke) shows good balance to 'chip' up to the green..
Lakeside Fun - Nigel Hailstone (Waiheke) didn't have a lot of joy on the 6th. Here he was lucky to stay dry for his second - a heafty uphill shank. Hailstone Contrast - In contrast to his little bro', Brett Hailstone (Waiheke) was driving well on the 6th. Roller! - Here is a classic example of the horror and dread the players all endured at sometime or another. And this one is on a fairly flat green! Brett is bemused to watch his accurate putt to the base of the basket pick up the roll. 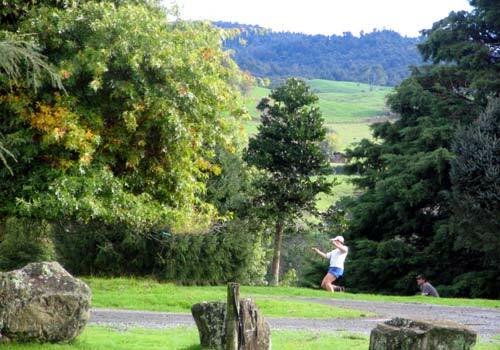 The Ming Fling - Showing the throwing style that has her placed as New Zealand Number One, Ming Menzies (Tauranga) is watched by Pete Boyle (Taumarunui) on the 11th fairway. Ming attributes her new extra distance to the precision 'pull' technique that Simon Feasey showed her. And it works - we never saw an unsteady throw from 'Kaching Ming'. Not Easy - Not even the close putts were easy when you had a backdrop like this! Nigel Hailstone (Waiheke) makes sure of it as memories of a 100 metre roller on the 17th come flying back to him. Understandable - That Brett Hailstone (Waiheke) should be angry with himself with another wayward putt. Nicknamed the Giant Killer after his efforts in the 2005 Matchplay Champs, Brett showed none of that confident putting this weekend. Mind you, is that his brother Nigel trying to put him off? The Jump - Local kiwifruit guru Richard Allen (Tauranga) places a nice blind putt over the horse jump on 15 and is pleased to hear 'kaching'.. He's Mad - He's Keene! 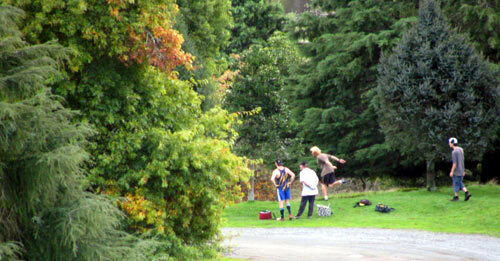 - There is much talk about newcomer soccer man David Keene (Auckland) and his quick rise to disc golf glory. Firmly entrenched in the second group for the weekend, many think its only a matter of time before he's yapping at the heels of the Feaseys and Marshalls. Lakeside Magic - Richard Allen (Tauranga) puts the shoulder in, glad he didn't get too close to the lake behind him. "Try and throw it 200m that way.." - Freaky Stylist Baz Keene (Taihape) points out the target to gumboot legend Ben. It was a good move, as Ben returned the favour by miraculously finding Baz's lost XL. Even more miraculous when you consider Baz lost it in Taumarunui! So That's How They Do It - One of the few shots we got of tournament winner Dean Marshall (Tauranga). 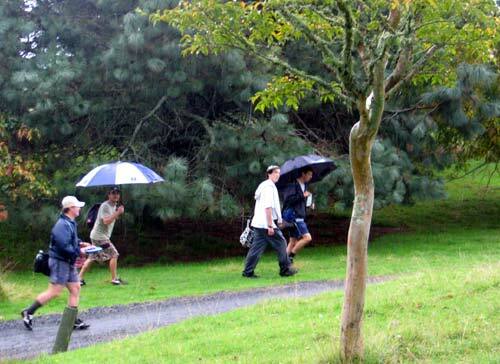 And we can see how the top players stay focused as both Dean and Simon stay dry under large umbrellas. "Should be banned" you can see Bruno saying. Nigel Watches Nigel - It was common to see players run forward from the tee on eighteen to see if they had picked up a roller or not. Here Nigel Hailstone (Waiheke) is so quick to check it out that our camera catches him twice. Is that an overstep? 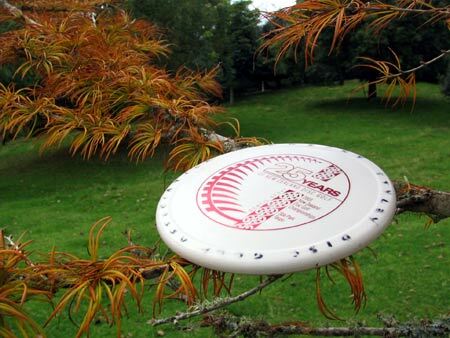 Disc in a Tree - McLaren Falls Park features a wide array of wonderful trees in stunning colours. But, as the disc golfers will attest to, they are all potential bunkers! By the way - if anyone finds that lovely Eagle underneath the knoll, Juan Unda (Mexico) would be most happy! 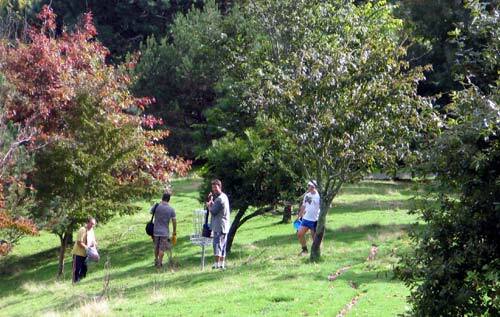 Disc in a Tree, Part Two - OK, this one was planted for the camera, but we sure did see some crazy disc lodgings. Eight Is Great - The new holes on this year's Extreme feature some spectacular over-the-crest blind shots. Here on the eighth, crazy looney Marty de Haas (Matamata) is watched by his fellow players in the second group. Doin' the Bruno Shuffle - Budding Foozball player Bruno Whale (Taumarunui) races in for a massive drive on the eighth. "This is Fun!" - Brett Hailstone (Waiheke) seems to be enjoying himself. Or is it because he's up by the basket and rival islander Nigel Barnwell is 120 metres down the hill trying to make his way back up. The rivalry between these Waiheke golfers was something to behold - next time we think we'll send them out with a match referee! 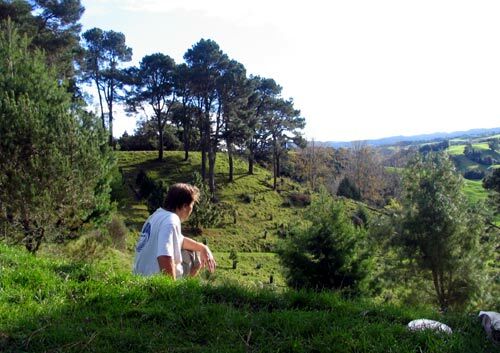 Taking in the View - Nigel Hailstone (Waiheke) takes a moment to enjoy the great views that the elevation of the park affords. Based on how long it took his groups to finish their rounds, he must have been taking in a lot of views.